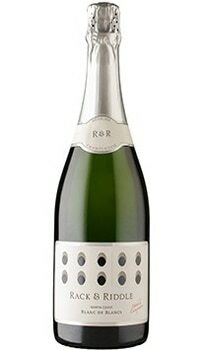 Rack & Riddle is among a handful of California wineries that employ the méthode champenoise, the traditional French process of producing sparkling wine. The winery's attention to detail can be seen and tasted in the North Coast Blanc de Blancs. This lively sparkling wine boasts bright and fruity aromas of green apple and melon, followed by strong flavors of lime and lemon curd, all of which resolve in a smooth and crisp finish.